Most people know that a raisin is a dried grape, but did you know that there are a few different varieties? The most common are natural dark purple ones and golden sultanas. But you may also come across seedless raisins, as well as those that are the crimson and flame variety, especially if shopping in an organic or gourmet market. What types of raisins are you looking for? Find out some tips on how you can keep your raisins fresh longer. The natural raisin, made from the Thompson seedless grape, is labeled "natural" because of how the grape is dried—simply by the sun, without any oils or solutions. Golden raisins, called sultanas, are made from the same types of grapes used to make natural raisins but go through a different processing method, as well as a sulfur dioxide treatment, that gives these raisins their rich, golden hue. Most raisins are sold in boxes or resealable packages you cannot see through so it is difficult to judge freshness by the eye. If you squeeze the box and it is squeezable and not hard, there is a good chance your selection is a good one. Another telltale sign is rattling. Give the container a good shake and listen. As raisins age, they continue to dry out, can shrivel up, even more, may harden, and will rattle around in a box or bag if shaken and dried up. It is important to store raisins properly, so they do not dry out too quickly. Seal raisins in an airtight container or bag and store in a cool, dark place. Most kitchen cabinets are too warm. A month on the shelf is the maximum time they should be left out, after that they begin to dry out, darken, and lose vitamins. Also, raisins are popular for attracting bugs, so be sure to scrutinize them for insect activity before using. Refrigeration is recommended for storage longer than a month. In a properly sealed container, raisins can last six months to one year. The high concentration of sugars in raisins are what make them sweet, but it is also what causes the raisins to become dried out and gritty, and stick to your teeth, after a long storage period. The sugars can crystallize inside the fruit, but that does not mean you cannot use them. There are a few ways you can revive dried-up raisins. After reviving the raisins, they should be eaten, added to recipes, or refrigerated on the same day. Plump up the raisins by blanching them in hot water. 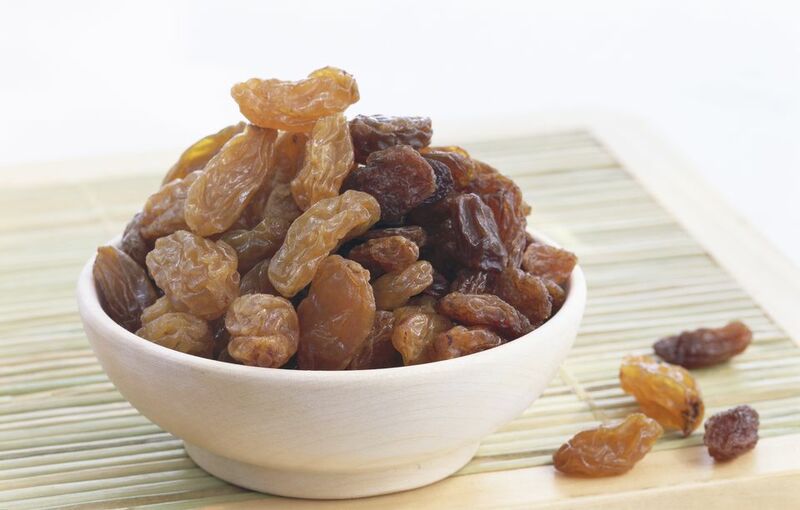 Place raisins in boiling water for 10 to 15 minutes until they begin to expand. You can add citrus zest, spices, or liquor to the water for extra flavor. Soften the raisins in the microwave. Place raisins in a bowl and drizzle with a few tablespoons of warm water. Microwave for 12 to 15 seconds, pour off any leftover water and let sit, covered. Once cooled, the raisins should absorb the moisture. Revive the raisins in the oven. Between layers of paper towels, spread the raisins on a cookie sheet and place in a 200 F oven for 20 to 25 minutes.